The Canterbury Nissan Showroom has been transformed into an “open and modern” space. Interaction has been improved as a result of the new interior with centralised customer areas and maximised visibility. To help identify diverse zones within the showroom choice of floor, wall and ceiling materials differentiate each area. The aim of the project was to strengthen Nissan’s brand image and improve operational efficiency. This was achieved as a result of upgrading the existing buildings in accordance with Nissan’s global standards. Works involved completely reconfiguring the showroom, rapid service workshop and parts store. As a result this has created a feature car display space; car handover room; customer lounge, reception; offices; meeting/training room and canteen area. The exterior appearance of the showroom was enhanced with new curtain wall glazing to replace sections of existing composite cladding. Areas of existing brick and blockwork received new panels to mesh with the other façades. New signage and a feature entrance were provided for the main showroom to create direct access for customers from parking areas. Works also included demolishing an existing 95m2 MOT building while carefully removing existing oil tanks to prevent contamination. 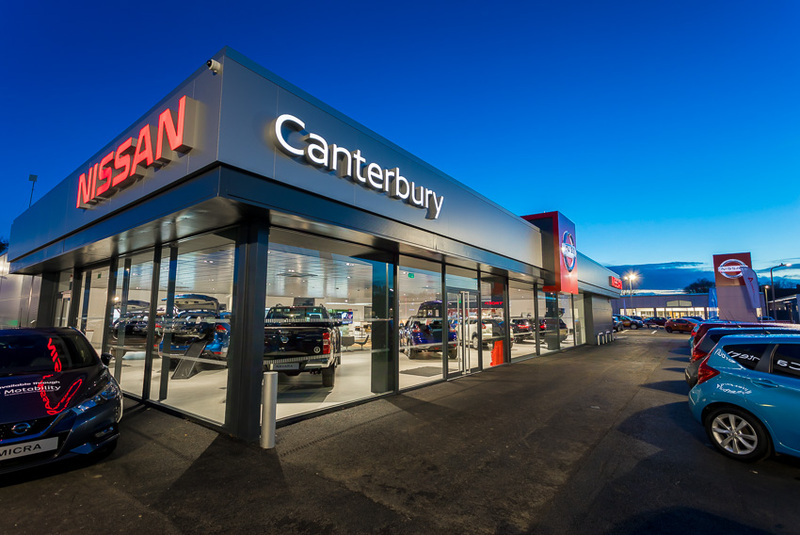 Canterbury Nissan is the latest in a range of car showrooms we have delivered including previous projects for VW, Ford and Volvo.